Greg Garnett | Abrahamse & Company Builders, Inc.
Greg Garrett is a Fluvanna native who has also lived in Newport News, where he worked in a shipyard for three years, and in Richmond, where he did construction. 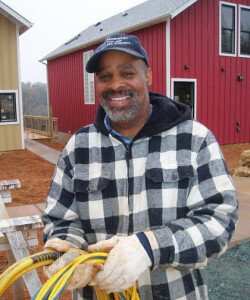 Before joining Abrahamse & Company in 1986, Greg was with the Albemarle Housing Improvement Program. Greg’s history with Abrahamse & Company goes back nearly to the company’s founding; only Dale Abrahamse has been with the firm longer. His commitment shows in his easy smile, his friendliness to customers and coworkers, and his willingness to take care of the details that make the company look good.